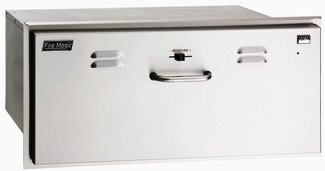 Complement your outdoor living area with the finest in quality and practicality, with our Aurora Warming Drawer. Temperature settings are from 140F. to 230F., allowing plates and food to stay at your desired temperature. A hidden control knob allows you to select dry or moist heat. A must have for your outdoor cooking experience. Cutout dimensions: 14 1/2"H x 31"W x 20 1/2"D.